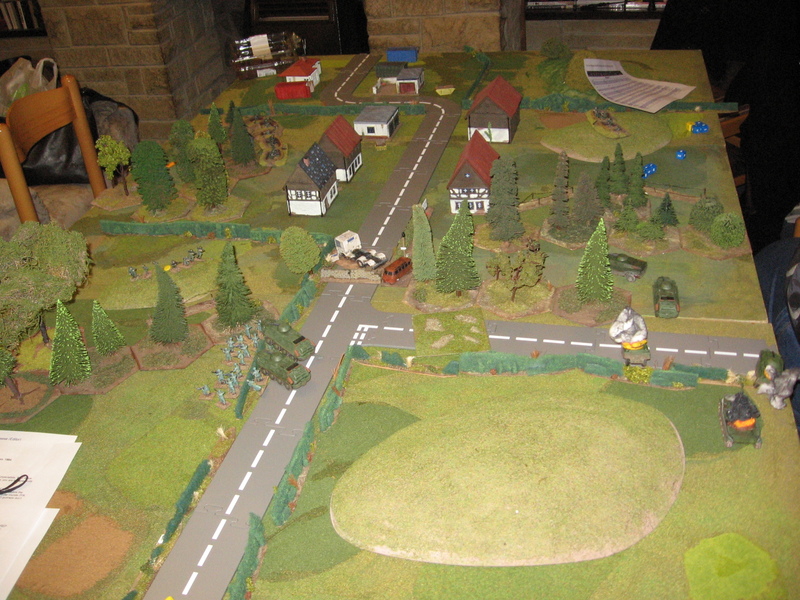 6mm Cold War game report. Pt1 the set up. 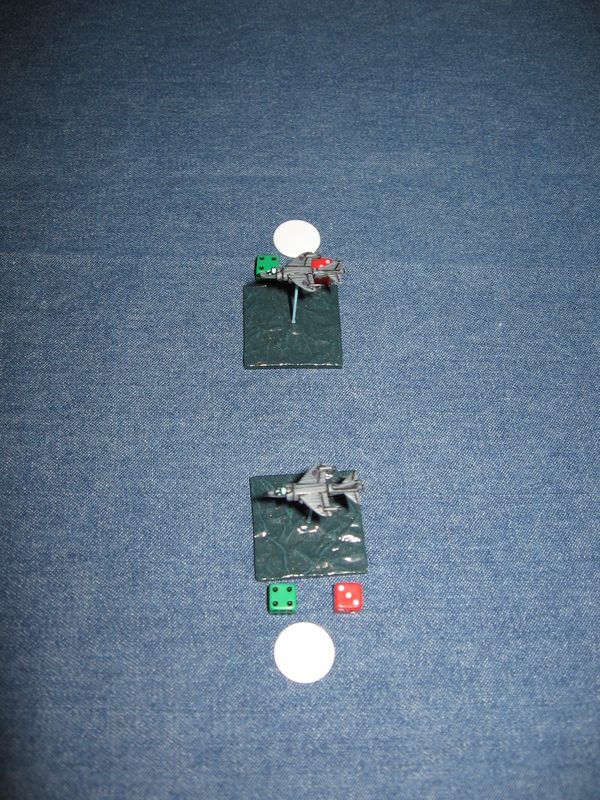 Earlier this week I umpired a game of 5core: Brigade Commander (by Nordic Weasel) for Evan and Brian. Location: The Former West Germany. Situation: The attack into Germany has gone well but the focus has shifted from our sector. Hold the line in the face of the counter attack. Victory Conditions: Control the North/ South Road. Initial deployment: Set up any where within 18” of the North/ South road. Special Rules: The weather is bad until informed otherwise. Max visibility is 24”. No aircraft can fly. 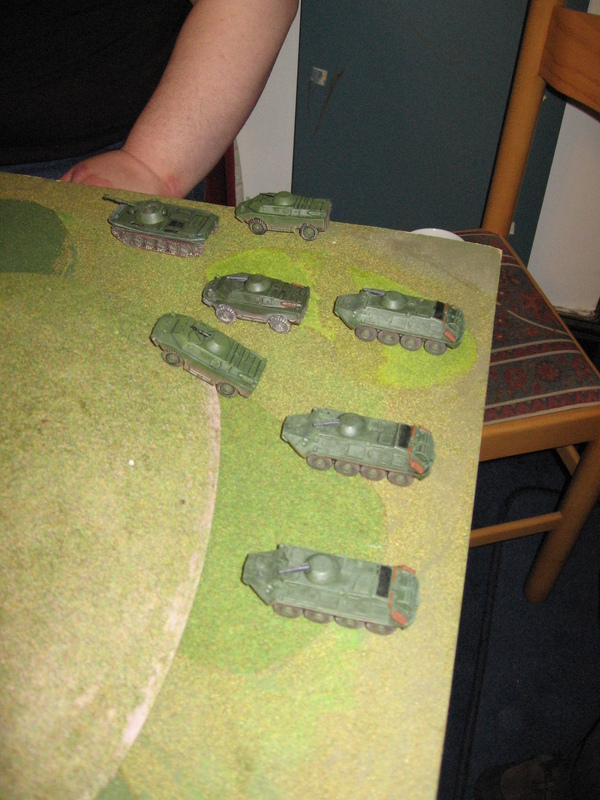 6 BMP Motor Rifle Coys. 2 Tank (T64 no ERA) Coys. 1 ATGM Coy (may be split into 2 attachments at your discretion). Situation: The Soviet offensive seems to have stalled, now is the time to counter attack to regain some lateral movement. Victory Conditions: Secure the North/ South Road. 1 one use Tactical Withdrawal. Whilst we were discussing possible games a bit back Brian made the suggestion to make cards to to played for the assets. These assets are one of my favourite parts of the rule set as they allow you to add a large degree of differentiation between the forces. While a big advantage of the system is that it takes a relative approach to vehicle performance it does mean that some units feel a bit generic. An hour or so on the PC saw these knocked up. 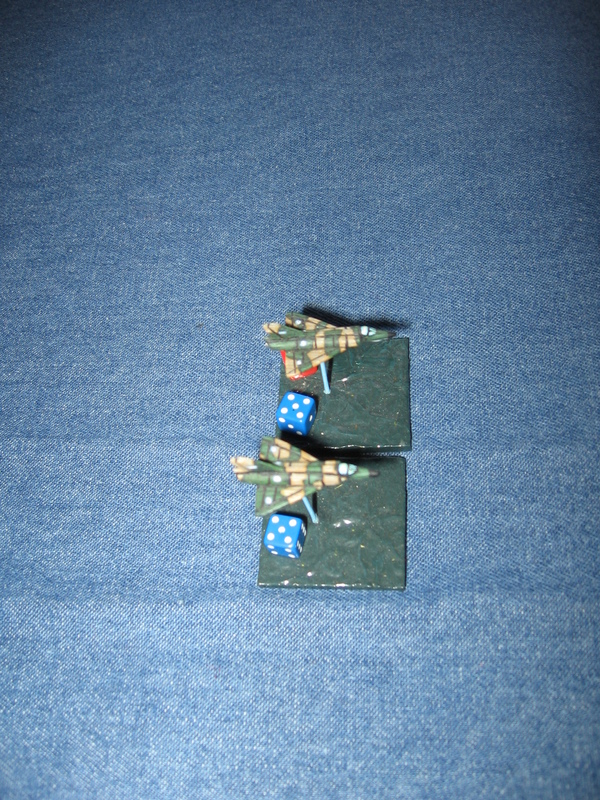 I printed them onto thin card then put them in the sleeves that Collectable Card Gamers use. Next will be the pictures from the game itself. Testing, Testing- some games in Development. 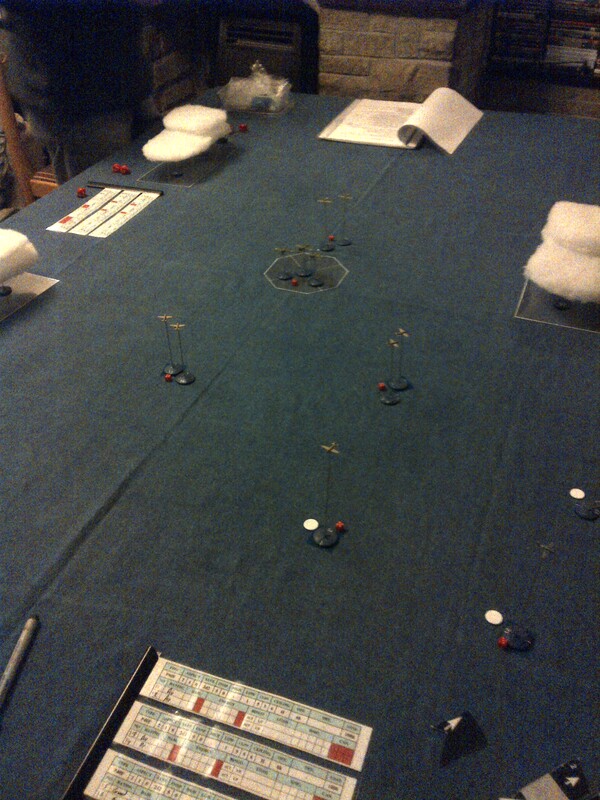 To prove this my last playtest was a bit of a bust- due to a poor scenario. The one in question was written by me several years ago and had provided a very enjoyable game of ‘Arc of Fire’, how ever just swapping it over to 2HW didn’t work. 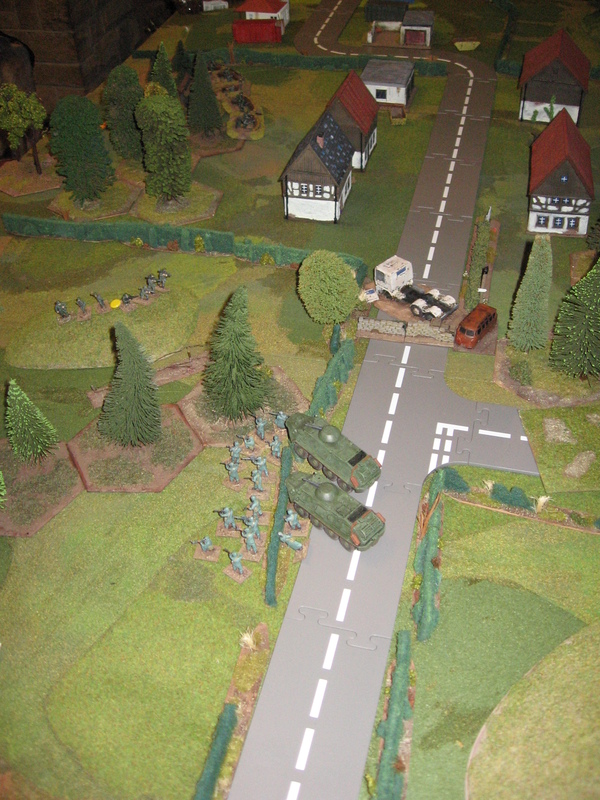 Set in the classic World War Three year of 1984 it saw a platoon of West German infantry defend a village against a platoon of Soviet infantry, a platoon of armoured cars and a tank (in this case a PT76), who opened the hostilities with a small mortar barrage. I think what made the game not play the same is the difference in ground scales between the two systems. Arc of Fire has a stated ground scale of 1″ = 10m, to put that into perspective a grenade can be thrown 2″. The 2HW system doesn’t have a published ground scale but a grenade can be thrown a full 6″… As a result the man portable Anti Tank weapons in a 2HW sized table are much more effective, the BRDM2s didn’t stand a chance. Still it was a learning experience and it provided a good example of how not to do scenarios, that said I do think the scenario idea is still a good one so I will revisit it soon. Anyway here a few pictures for your edification. 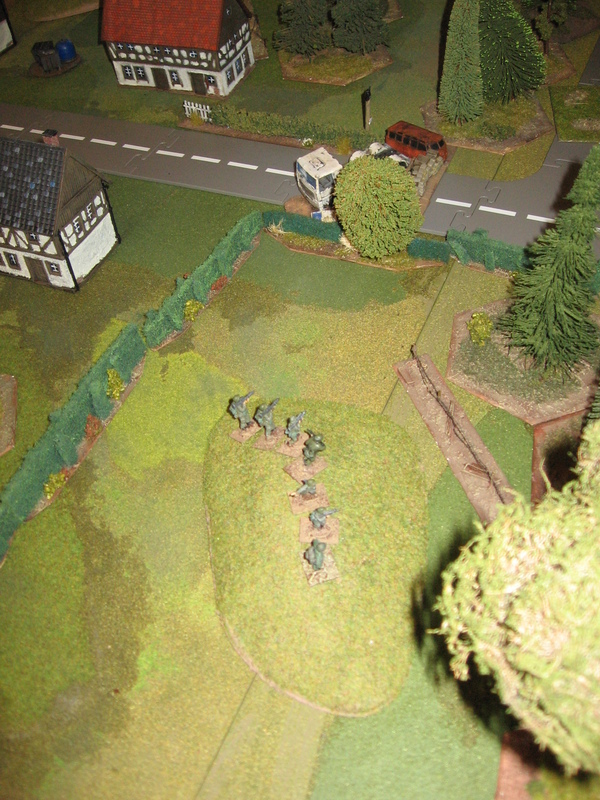 Infantry move up to deal with the defenders. General shot of the table. Now on to more successful endeavours: I mentioned in my previous post that we’d be having a Falklands Air War game, Bill turned up with his aircraft and I drafted some missile rules to go with them. As stated last time these are for the heavily modified rule set mainly developed by Evan, I tried to keep the rules simple but give a little flavour for the period, I’d like to think I achieved that as everyone seemed to be having fun as we got through several little air skirmishes in the evening. A pair of Sea Harriers. Dogfight in the South Atlantic, Sea Harriers engage Skyhawks. Bill’s aircraft were very nicely painted- the bought them off a forum several years back he said. 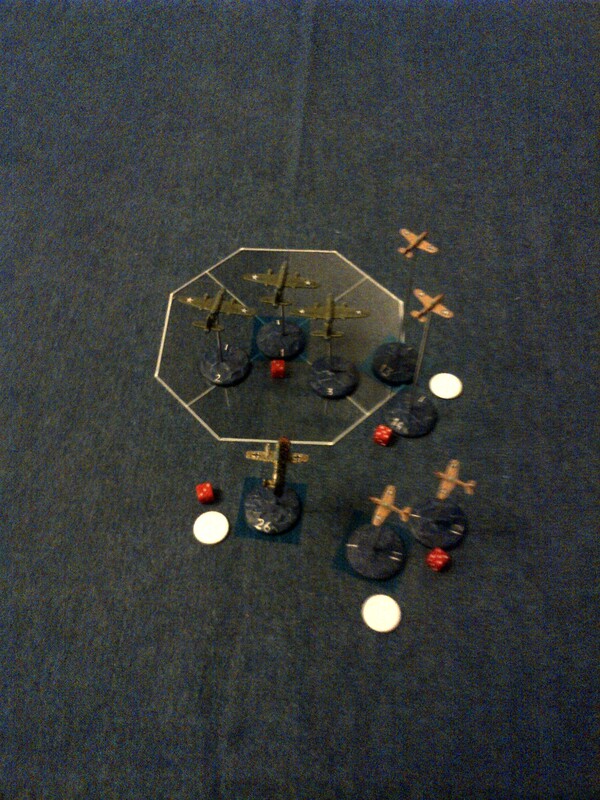 As the missile rules worked so well, I’ll be painting up my Vietnam aircraft soon to get a few games out of them, though I’ve the odd idea to look at the Cenepa War of 1995…. Evan’s latest addition to the air combat system is to bring in rules to ‘jump’ out of the sun on to unsuspecting aircraft, we had another test of these this Tuesday gone. 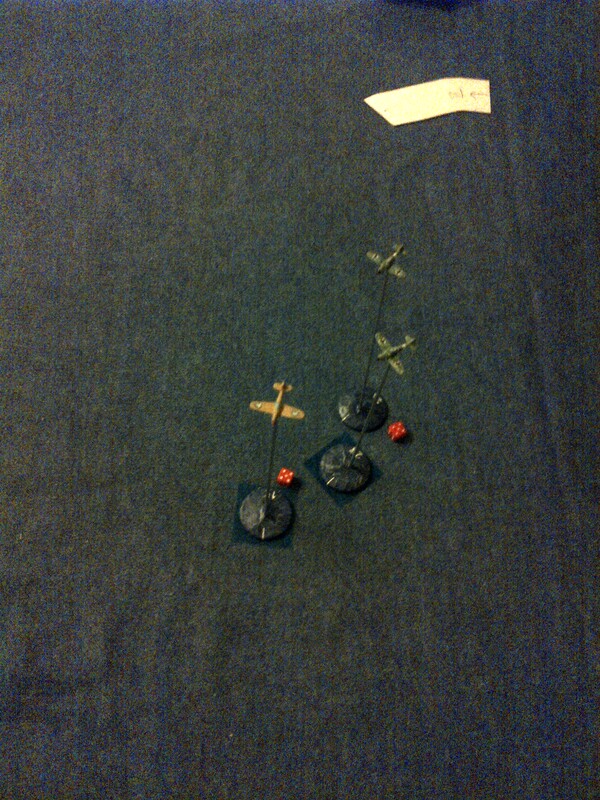 B26 Marauders, escorted by P40s were jumped by a mixed attacking group of Bf109s and Me110s. 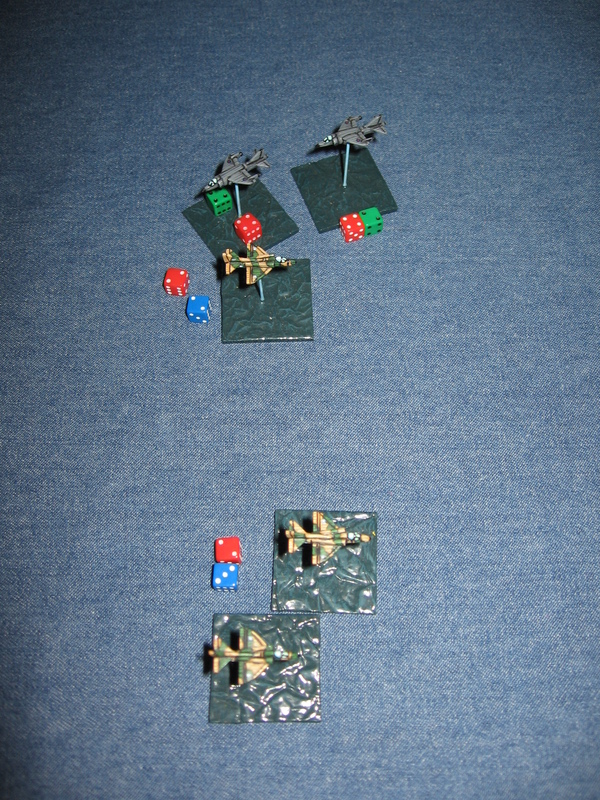 Much fast paced action was played out of the table top with successive flights of aircraft trying to get the advantage over the other. I think we’ve got the rules pretty much nailed down now, so we can expand on the different theatres we cover, Evan was last seen ordering flights of B17s so hopefully we’ll have some daylight raids over the Reich soon… however I think next weeeks game will be back to 20mm. If anyone does a similar game themselves let me know, I’d be interested to see your take on it.